Below is a list of study references that are recommended to assist the candidate in preparing for the REHS/RS examination. Some references are available for purchase through the NEHA online Bookstore. This study guide has been revised and updated to reflect changes and advancements in technologies and theories in the environmental health and protection field. 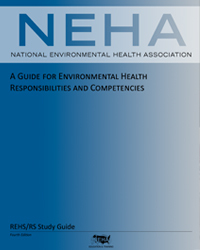 This essential reference is intended to help you prepare for the NEHA Registered Environmental Health Specialist/Registered Sanitarian (REHS/RS) Credential. 1. REHS/RS Study Guide (Fourth Edition), 2014, NEHA. NEHA also offers an online REHS/RS self paced study course.